Ye (stylized as ye) is the eighth studio album by American rapper Kanye West. It was released on June 1, 2018. Ye is the second of five albums produced by West set to be released in the summer of 2018, with a seven-track album being released every week following the release of Pusha T's Daytona. The album succeeded the release of Daytona and preceded the release of West's collaboration with Kid Cudi titled Kids See Ghost, Nas' upcoming eleventh studio album, and Teyana Taylor's second studio album. 1 "I Thought About Killing You"
Paul Rosenberg and Team Def Jam, having just returned from a whirlwind trip to Wyoming, are noting the numbers of Kanye West's new, highly touted seven-song release. Seen just before cutting off some rustlers at the pass are (l-r) Rich Isaacson, Marcus “Ike” Ferrer, Scott Greer, Gabe Tesoriero, Rosenberg, Jen Hirsch, Scott Maness, Noah Callahan-Bever, Bruce Carbone and photographer Marcus Hyde. More new release numbers are expected soon. Kanye West's Ye appears headed to collect around 200 million streams in its first week, as the seven-track release heads for a #1 bow on our Top 50 chart. Post Malone's beerbongs and bentleys may log another week over 100k, its sixth, and should now be eligible for double Platinum certification, having collected over 1m in total activity in its first five weeks of release. Luke Combs' deluxe This One's For You lands in the Top 5 with the release of its deluxe version, This One's For You Too. 02 (NEW) 01 YE 22,192 copies (including 18,112 from sales-equivalent streams). The eighth studio album for Kanye West simply entitled 'ye' becomes his second chart topping set in Australia, debuting at the top of the ARIA Albums Chart. "ye' becomes the 825th No.1 Album in Australia (1965 to 2018) and the 676th for ARIA (1983 to 2018), plus the 468th to debut at No.1 and now the fifth for the Def Jam record label, their last one being "Blonde" by Frank Ocean (29th Aug, 2016), while it is also the second No.1 for Kanye West, whose last charted album (his sixth, as his seventh 'The Life of Pablo' didn't chart here) "Yeezus" was at the top almost five years ago (24th June, 2013, 1 wk) and this becomes his fifth Top 10 album here too. All seven tracks from the 'ye' album have landed within the Top 50 this week, with "All Mine" the highest at No.12, while no previous album has been named 'ye' to hit No.1 here, it is a shortened version of his his sixth set 'Yeezus', while the new No.1 also becomes the 290th by an American performer to hit No.1 (solo, duo or group) and the 231st for a Solo Male Artists (local or overseas). The new album came in at No.2 in the UK and No.1 in New Zealand, plus with a new collaboration album with Kid Cudi entitled "Kids See Ghosts" released on Friday, Kanye could be back at the top again next week (maybe). * #22 - Ghost Town by Kanye West (from PartyNextDoor, Kid Cudi & O7O Shake) (feats samples of 'Take Me for a Little While' by The Royal Jesters and 'Someday' by Shirley Ann lee). * #46 - No Mistakes by Kanye West (from Charlie Wilson & Kid Cudi) (feats samples of 'Children (Get Together)" by Edwin Hawkins Singers and 'Hey Young World' by Slick Rick). All seven entries this week for Kanye West are taken from his eighth studio album 'ye' which debuts at the top of the ARIA Albums chart, plus he could be there again next week as his new collaboration album with Kid Cudi was released on Friday entitled "Kids See Ghosts". He's earned all eight consecutively, tying Eminem and The Beatles for the longest streak of No. 1s. Kanye West lands his eighth No. 1 album on the Billboard 200 chart, as his latest studio effort, Ye, bows atop the list. The set -- which was released on June 1 via G.O.O.D. Music/Def Jam Recordings -- earned 208,000 equivalent album units in the week ending June 7, according to Nielsen Music, and is the fifth-largest week for an album in 2018. Of Ye’s starting sum, 85,000 were in traditional album sales. The Billboard 200 chart ranks the most popular albums of the week in the U.S. based on multi-metric consumption, which includes traditional album sales, track equivalent albums (TEA) and streaming equivalent albums (SEA). The new June 16-dated chart (where West debuts at No. 1) will be posted in full on Billboard's websites on Tuesday, June 12. Kanye West performs onstage with rapper A$AP Rocky during day 1 of the 2016 Coachella Valley Music & Arts Festival Weekend 1 at the Empire Polo Club on April 15, 2016 in Indio, Calif.
Fifth-Biggest Week of 2018: As Ye starts with 208,000 equivalent album units, it logs the fifth-biggest week for an album this year. The only larger frames were earned by the debut weeks of Post Malone’s beerbongs & bentleys (461,000), J. Cole’s KOD (397,000), Justin Timberlake’s Man of the Woods (293,000) and Cardi B’s Invasion of Privacy (255,000 units). Kanye West accepts the Michael Jackson Video Vanguard Award onstage during the 2015 MTV Video Music Awards at Microsoft Theater on Aug. 30, 2015 in Los Angeles. Seventh-Largest Streaming Debut Week Ever: Of Ye’s first week units, 120,000 were SEA units. That sum equates to 180.1 million on-demand audio streams for the set’s seven songs during the tracking week (as each SEA units equals 1,500 on-demand audio streams). 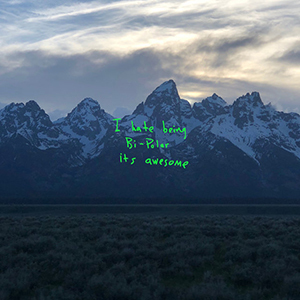 Ye’s streaming launch is the seventh-biggest debut streaming week for an album. That’s a pretty notable feat, considering Ye only has seven songs. Thus, each tune, on average, garnered 25.7 million on-demand audio streams. The only album to tally a larger per-track streaming average was J. Cole’s KOD earlier this year. During its opening frame, the 12-song album earned 322.7 million on-demand audio streams, resulting in a 26.9 million per-track average. At No. 2 on the new Billboard 200, Post Malone’s former No. 1, beerbongs & bentleys, is a non-mover with 99,000 units (down 5 percent). Kanye West poses before Christian Dior 2015-2016 fall/winter ready-to-wear collection fashion show on March 6, 2015 in Paris. Ghost previously visited the top 10 with a pair of No. 6-peaking efforts: Popestar (EP) in 2016 and Meliora in 2015. Country singer Luke Combs nabs a new chart high with his This One’s for You album, as the set zooms from No. 39 to No. 4, thanks to a deluxe reissue of the album on June 1. The set, bolstered by five new songs, garnered 55,000 units (up 314 percent). The album blows past its previous best week, logged when it bowed at No. 5 with 43,000 units on the June 24, 2017-dated tally. Cardi B’s Invasion of Privacy is steady at No. 5 on the new Billboard 200 (49,000 units; up 3 percent), Juice WRLD’s Goodbye & Good Riddance continues to climb, as it rises 8-6 (42,000 units; though down 3 percent), and The Greatest Showman soundtrack ascends 9-7 (just under 42,000 units; down 3 percent). Shawn Mendes’ self-titled album falls from No. 1 to No. 8 in its second week (39,000 units; down 78 percent), Lil Baby’s Harder Than Ever slips 7-9 (37,000 units; down 18 percent) and Jason Aldean’s Rearview Town vaults 27-10 (34,000 units; up 117 percent). The latter set, like Ghost’s Prequelle, is goosed by sales generated from a ticket/album sale redemption offer.